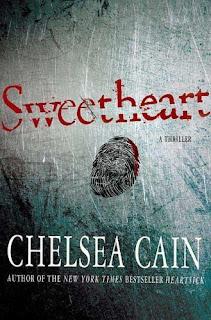 I recently finished Sweetheart by Chelsea Cain. Picking up where HeartSick left off, it continues the story of the twisted and brutal relationship between detective Archie Sheridan and serial killer Gretchen Lowell. Just my cup of tea! A little way into the book I was afraid I was going to be disappointed—I wasn't buying the way one of the character's behavior and attitude appeared to be shifting. In the end, however, it all made sense. How did it not occur to me previously that there are pen blogs? I have a feeling I'm going to be spending way too much time at Alltop: Pens. Apparently something's going wrong with the economy. An econopocalypse, we heard. Thus, we have put together an emergency bailout package for the book-buying public. Once again, almost everything on our site is half-off, or even cheaper, for just a few more days -- soon it'll be too late to guarantee Christmas delivery, so now is the time. And once again, we've got everyone on your list covered. We've restocked the immediately beloved "What Happens in La Brea Tar Pits, Stays in La Brea Tar Pits" t-shirt, and we've piled high the stacks of Comedy by the Numbers for your insufficiently funny friends. For all the hungry nondenominational holiday-enthusiasts in your life, there's Lemony Snicket's Christmas story The Latke Who Couldn't Stop Screaming, and for the impatient McSwys newcomer we've got the Instant Gratification Subscription. There's lots more on the site, and everything's cheap, so click here. Maybe you missed your chance before, or maybe you just want to stuff even more stockings. Either way, do not deny yourself these simple pleasures, the joy of giving and/or hoarding. Please go now: http://store.mcsweeneys.net. The Second Crazy Excessive Sale ends this Friday. I've always thought Robert Harris writes great historical fiction/thrillers. Fatherland is a creepy alternative-universe story about a world in which Hitler was not defeated; it's also a detective story--a police procedural at that. Enigma (hate that movie tie-in cover; alas) is about the code breakers in England during World War II; I believe Alan Turing was one of the code breakers and that he appears in the novel as well. Harris has also written a couple of nonfiction works--the one I read is Selling Hitler, which is about the Hitler diary forgeries/scandal of the early 1980s. That's also a fascinating book. Oh, and he wrote Pompeii and Imperium, the first of which, in conjunction with HBO's series Rome (one of my all-time favorite TV shows), caused me to read fanatically about ancient Rome, Pompeii, Caesar, and so forth. I even went to the Field Museum to see the Pompeii exhibit there. Anyway, all of this is to say that I'm a Robert Harris fan and that I like his thrillers; they're fun to read and they're intelligent. 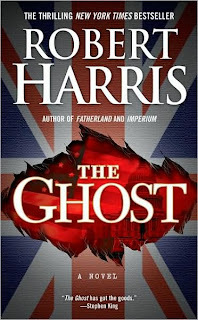 The Ghost, his latest, takes place in a world similar to our own in which a ghostwriter (who refers to himself as a ghost and who, I think, never tells us his name) is hired to help write the memoirs of the (fictional) former British prime minister Adam Lang. As the ghost becomes more involved with the book, he starts to uncover a scandal. The prime minister is obviously a Tony Blair figure, and the book seems in part an exercise in speculation about why a relatively sane figure like Blair would throw in his hat with the Americans in the Iraq war. Blair suffered profoundly in England for his alliance with GWBIII, and the character of Adam Lang suffers as well. I won't say more of the plot other than to say that the speculation perhaps goes a bit far but that I found the book very engaging. It's neat to have a ghostwriter as a main character, and I liked the passages where the narrator discusses the craft of ghostwriting, the processes he uses and so forth. The ghost talks a lot about how he "creates" life stories with his subjects--how, along with the subject, he decides on the kind of tale to tell. It's an interesting way to think about the complicated relationship between fiction, memory, and memoirs. The book also asks us to contemplate the relationship between politics and ghostwriting, and the made-upness of all political "personalities," and to see both writing and politics as fields in which stories/narratives are used strategically. Near the end of the novel, the ghost ends up comparing his version of the PM's memoir to an earlier, plodding one written by a more pedantic "researcher," someone who was not a skilled writer (in fact, the ghost has been hired to "fix" this early draft)--and the ghost ultimately comes to some very interesting conclusions/realizations about the same manuscript he once derided. He seems to be both embarrassed and proud of his own craft as a ghostwriter. The plot gets a bit clunky? crazy? too "far out"? near the end. I can't describe exactly what I felt; mostly, I guess it made my eyebrows raise, which is to say that in some places, it seemed to stretch the limits even of conspiracy novel plausibility. Plus, I believe the ghost is a bit naive, but perhaps this is just bec. I've read a lot more thrillers than he has. Anyway, I read this book straight through--devoured it, really--and I've been thinking about it ever since I finished it. That's pretty much all I usually ask from a thriller--that it hold my attention and make me think--and this one delivered on both counts. Today is repeal day. While you are having a drink to celebrate take some time to check out these great drinking (and not-drinking) books. What are your favorite drinking (or not-drinking) books? I loved this book. Not even half way through it I deliberately slowed down my reading so I wouldn't finish it too quickly. I'm not going to say anything else about it. Just go read it. Thirty years ago, six-year-old Joanna witnessed the brutal murders of her mother, brother and sister, before escaping into a field, and running for her life. Now, the man convicted of the crime is being released from prison, meaning Dr. Joanna Hunter has one more reason to dwell on the pain of that day, especially with her own infant son to protect. Sixteen-year-old Reggie, recently orphaned and wise beyond her years, works as a nanny for Joanna Hunter, but has no idea of the woman’s horrific past. All Reggie knows is that Dr. Hunter cares more about her baby than life itself, and that the two of them make up just the sort of family Reggie wished she had: that unbreakable bond, that safe port in the storm. When Dr. Hunter goes missing, Reggie seems to be the only person who is worried, despite the decidedly shifty business interests of Joanna’s husband, Neil, and the unknown whereabouts of the newly freed murderer, Andrew Decker. Across town, Detective Chief Inspector Louise Monroe is looking for a missing person of her own, murderer David Needler, whose family lives in terror that he will return to finish the job he started. So it’s not surprising that she listens to Reggie’s outrageous thoughts on Dr. Hunter’s disappearance with only mild attention. But when ex-police officer and Private Investigator, Jackson Brodie arrives on the scene, with connections to Reggie and Joanna Hunter of his own, the details begin to snap into place. And, as Louise knows, once Jackson is involved there’s no telling how many criminal threads he will be able to pull together—or how many could potentially end up wrapped around his own neck. In an extraordinary virtuoso display, Kate Atkinson has produced one of the most engrossing, masterful, and piercingly insightful novels of this or any year. It is also as hilarious as it is heartbreaking, as Atkinson weaves in and out of the lives of her eccentric, grief-plagued, and often all-too-human cast. Yet out of the excesses of her characters and extreme events that shake their worlds comes a relatively simple message, about being good, loyal, and true. 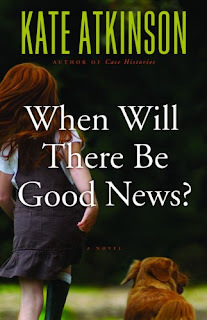 When Will There Be Good News? shows us what it means to survive the past and the present, and to have the strength to just keep on keeping on. I also recommend all of her other books, especially Behind the Scenes at the Museum.